Agapanthus are one of the most used, versatile plants in gardens around the world. Why is this so? They are so easy to grow and flower prolifically even when neglected. Agapanthus are deservedly popular and have been in cultivation for many centuries. Little after care is needed. Pest and disease are minimal problems. Plants will grow and flower best in fertile, loamy gardens but will tolerate most soil types. For best growth and flowering general garden watering will give best flower formation and more flower heads.Flowers are great cut for use in interior floral arrangements, they last well. Agapanthus are used extensively in garden beds and borders. In parks and commercial settings long swathes of them are often seen defining a landscape plan. Sunny positions are best but many plantings are seen as under-story plants where tree roots are competition. Agapanthus are thriving even there. In shade the flowering is nowhere near as good but the plants with their distinctive leaves earn their place.Agapanthus are drought tolerant and can tolerate reasonably cold weather.They will grow in most soil types.In most soil types fertilizing can be used sparingly but naturally some general fertilizer once or twice a year will keep the plants growing to their best potential. Coming from Southern Africa Agapanthus praecox grows into a emerald green leafed clump which bears many flower heads in season. 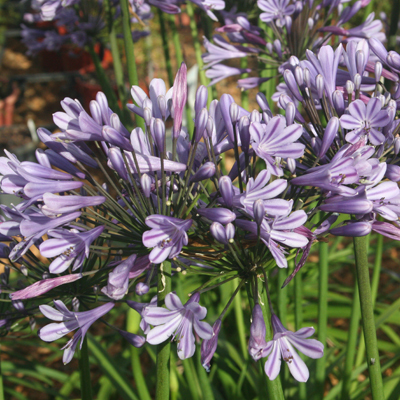 A large number of horticultural hybrids have been developed from Agapanthus praecox, the parent of Amethyst over the years. These are widely grown in gardens everywhere.Notes on their culture in Great Britain go back to the 16th Century.